I’ve been loving half square triangles (HSTs) lately. 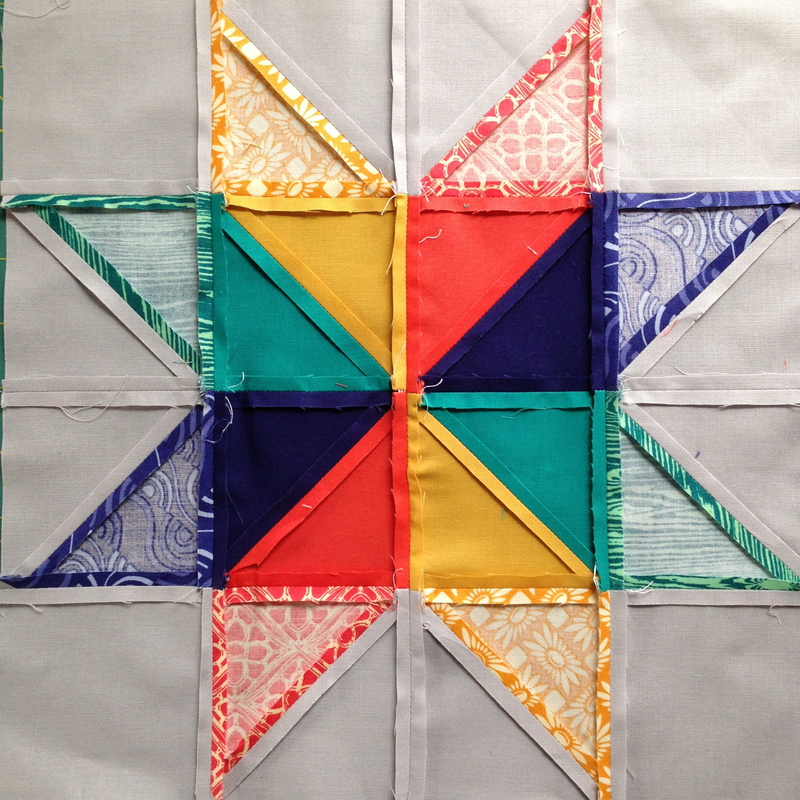 They were the building blocks for some of my favorite recent quilts, like the BFF quilt and the Mihow quilt. There are just so many things they can do. After talking with Beth at Rock Paper Scissors, the LQS where I teach, we decided that the next logical step after quilting basics is to learn how to make HSTs. And so I’m excited to announce a new class, the first in a series that we’re calling Building Blocks. 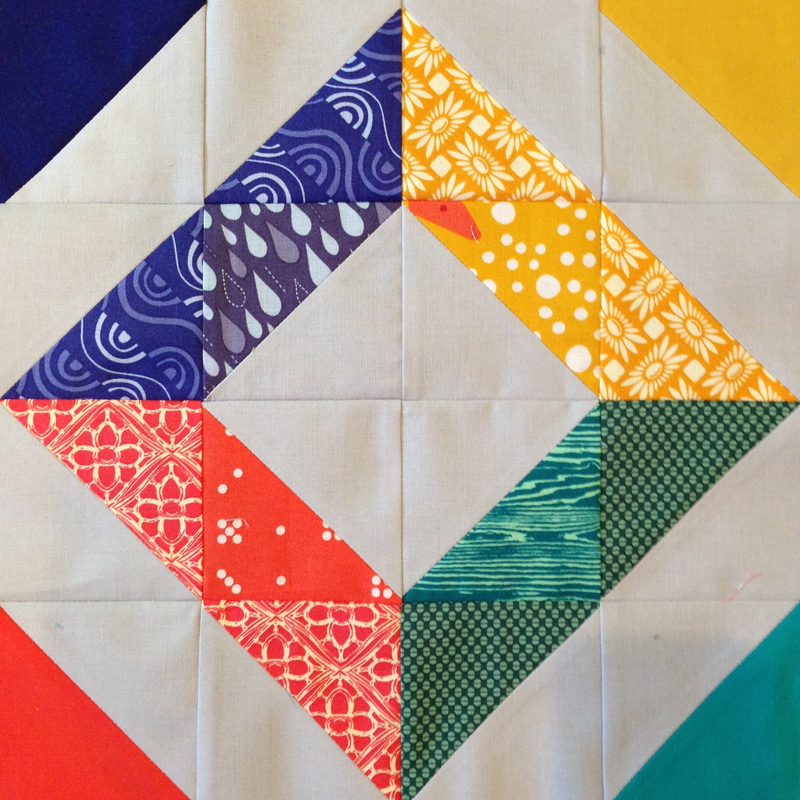 Building Blocks – HSTs will debut on April 2 (call the store to sign up if you’re local and interested). That means I got to make samples. How cheery are these blocks? They’re perfect for this time of year, when I am so ready for COLOR! 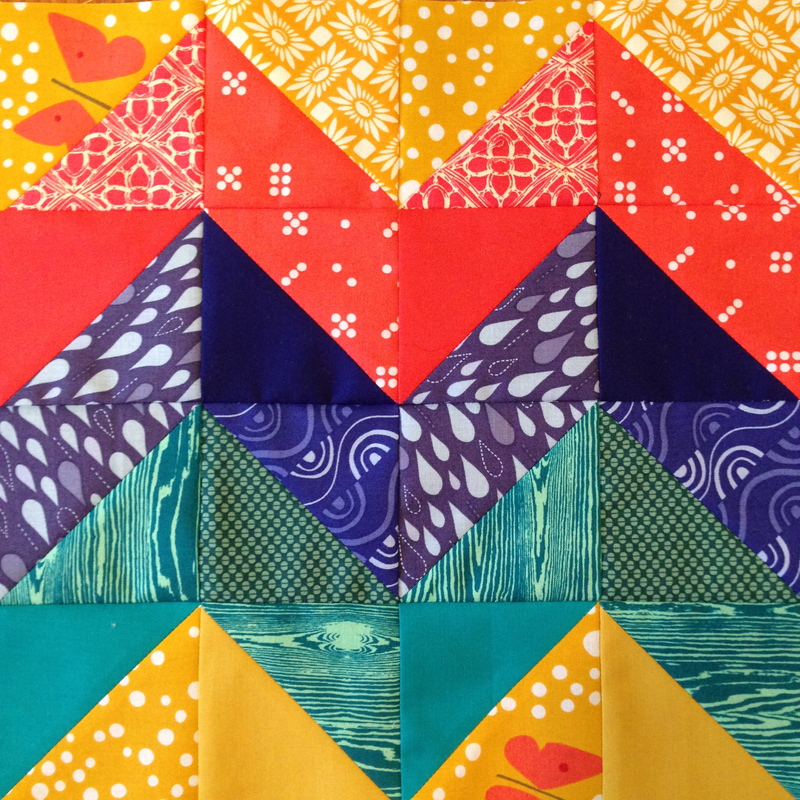 I used my four favorite Kona colors of the moment– Coral, Curry, Jade Green and Nightfall and scoured the FQ drawers for coordinating prints. Then I got to play with placement and color to make three block designs. 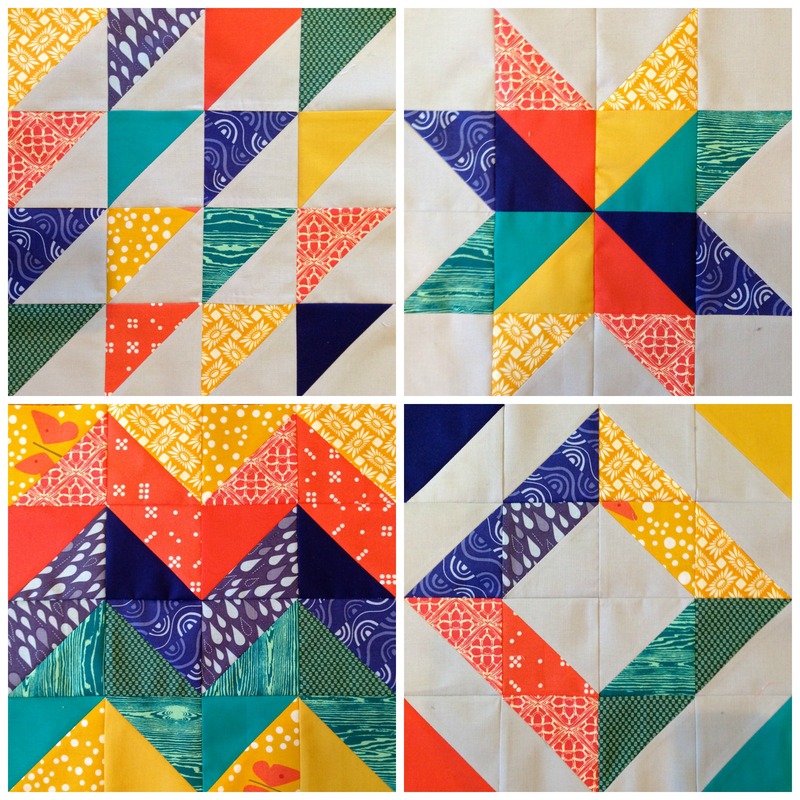 Students will make one of these 12.5″ blocks and take home patterns for the other two. 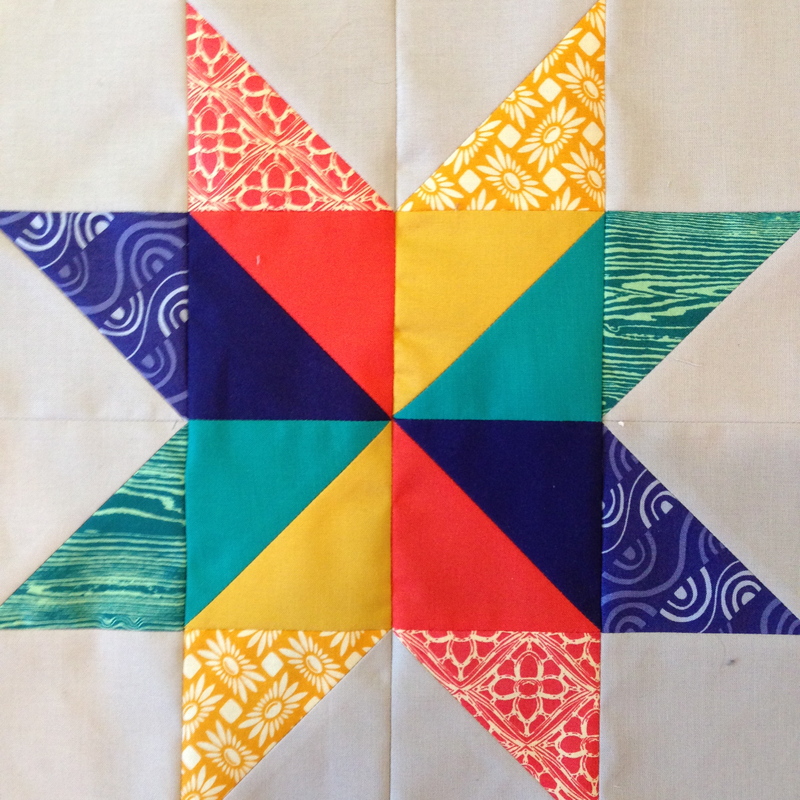 We’ll also talk about how to design your own quilts using HSTs. I’m really looking forward to it. Because these are samples that will be used for teaching and hang in the store, I took extra care to match corners and press seams. The backs of my blocks rarely look like this, but I just have to document this star. I pressed every seam open. I never do that– for the other three blocks I nested the seams in each row. It looks amazing, but it takes a lot of patience. What’s your favorite HST design? 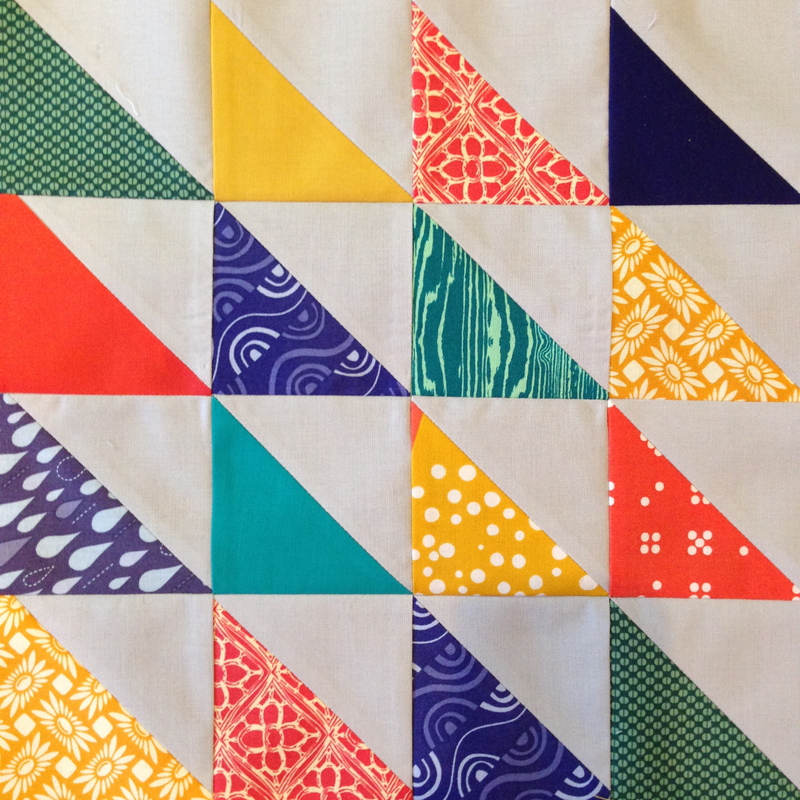 I didn’t even get into ribbons or angles or herringbone… such a versatile block. ← Meeting this Thursday March 20! Can’t wait for this class! If you are local, sign up soon! Melanie teaches the BEST classes! Absolutely love HST! I have been wanting to make chevron for the longest time. Now I have no reason not too! I think I am coming to this class Mel. Calling today to reserve a spot!!! See you in 2 weeks. Every quilter needs to know these. And as they gain experience, they can learn that there are about 30 different ways to do them! 🙂 Love the pressed-open seams. I don’t press all my seams open (usually), but I do press a lot. Especially when there are multiple seams at an intersection, it helps the piece lie flat. I don’t think I could pick a favorite HST design! They’re so versatile that I do something new and fun almost every time. And depending on the design I almost always press the seams open, everything just turns out nicer, and flatter. Yours are so bright and pretty!